Just a couple hours ago there was an earthquake along the Swan fault, which is the transform plate boundary between the North America and Caribbean plates. The Cayman trough (CT) is a region of oceanic crust, formed at the Mid-Cayman Rise (MCR) oceanic spreading center. To the west of the MCR the CT is bound by the left-lateral strike-slip Swan fault. To the east of the MCR, the CT is bound on the north by the Oriente fault. Based upon our knowledge of the plate tectonics of this region, I can interpret the fault plane solution for this earthquake. The M 7.6 earthquake was most likely a left-lateral strike-slip earthquake associated with the Swan fault. I plot the seismicity from the past month, with color representing depth and diameter representing magnitude (see legend). I include earthquake epicenters from 1918-2018 with magnitudes M ≥ 6.5 (and down to M ≥ 4.5 in a second poster). I plot the USGS fault plane solutions (moment tensors in blue and focal mechanisms in orange) for the M 7.3 earthquakes, in addition to some relevant historic earthquakes.There have been several M 6.7-M 7.5 earthquakes to the west of this fault in the last 4 decades or so. 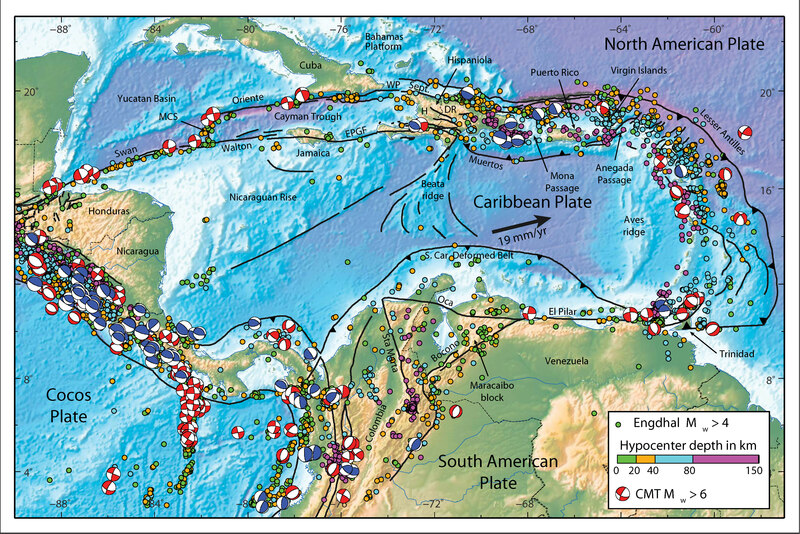 In the upper left corner is a plate tectonic map showing the major plate boundary faults in the Caribbean region. Symithe et al. (2015) plot fault plane solutions for earthquakes M ≥ 6. I place a blue star in the general location of today’s M 7.6 earthquake. In the upper right corner is a different plate tectonic map from García-Casco et al. (2011). I place a blue star in the general location of today’s M 7.6 earthquake. In the lower right corner is a figure from Mann et al., (1991) that shows the magnetic anomalies in the oceanic crust of the Cayman trough. The short vertical subparallel black lines are magnetic anomalies, identified from magnetic surveys with ages constrained by rocks from the seafloor. As the crust spreads from the Mid Cayman Ridge, and Earth’s magnetic field polarity flips, the changes in magnetic polarity are recorded in the crust. The crust closest to the MCR is youngest. I place a blue star in the general location of today’s M 7.6 earthquake. Below are the USGS websites for the earthquakes plotted on the poster above. UPDATE: 2018.01.10 9 AM pacific time. There were two observations of a small amplitude (small wave height) tsunami recorded on tide gages in the region. Below are those observations. Here is the map from Mann et a. (1991). Note how today’s earthquake is in an area that may have overlapping faults of different types. A. Tectonic map of Cayman trough region showing strike-slip faults (heavy lines), oceanic crust (gray) in Cayman trough, and magnetic anomaly identifications (numbered bars) (after Rosencrantz et a., 1988). Arrows show relative displacement directions. Fault zones: OFZ – Oriente; DFZ- Dunvale; EPGFZ – Enriquillo-Plantain Garden; WFZ – Walton; SIFZ – Swan Islands; MFZ – Motagua. Bl. Late Miocene reconstruction of Cayman trough. C. Early Miocene reconstruction. Here is the large scale map from ten Brink et al. 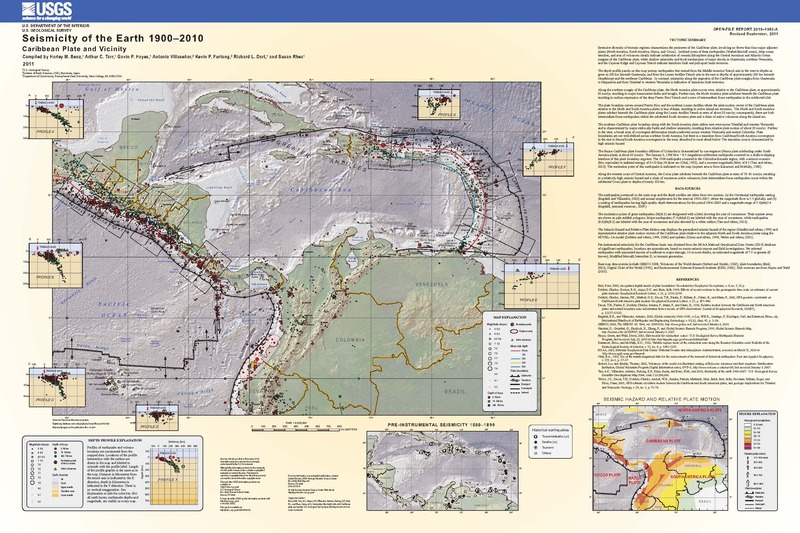 (2002) showing the bathymetry surrounding the Mid-Cayman Rise. Bathymetry of central Cayman Trough adapted from Jacobs et al. (1989). Contour interval: 250 m. Dotted line: location of gravity transect. Here is the USGS Tectonic Summary for this 2018.01.10 M 7.6 earthquake. A more comprehensive review can be found here. While commonly plotted as points on maps, earthquakes of this size are more appropriately described as slip over a larger fault area. Strike-slip-faulting events of the size of the January 10, 2018, earthquake are typically about 140×20 km (length x width). 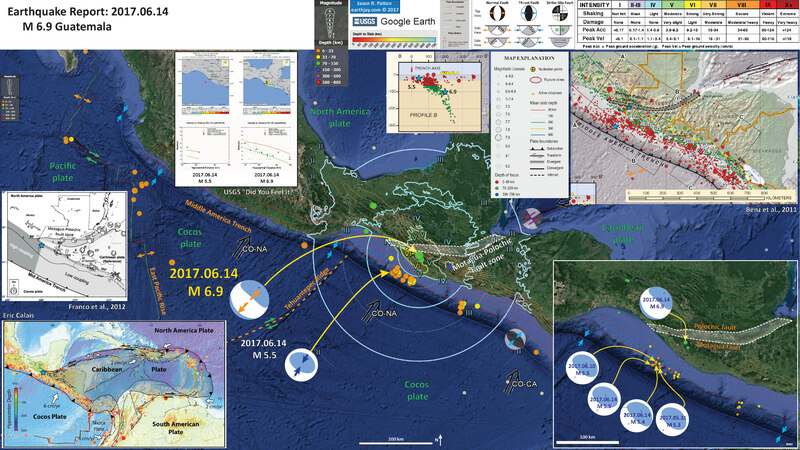 Nine other earthquakes of M 6 or larger have occurred within 400 km of the January 10, 2018 event over the preceding century. 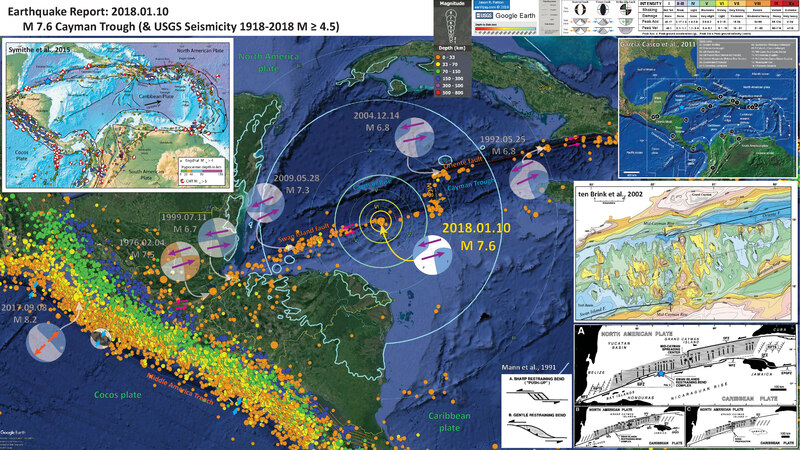 Previous strong earthquakes along the North America-Caribbean plate boundary in this region include the destructive M 7.5 Guatemala earthquake of February 4, 1976, which resulted in more than 23,000 fatalities. 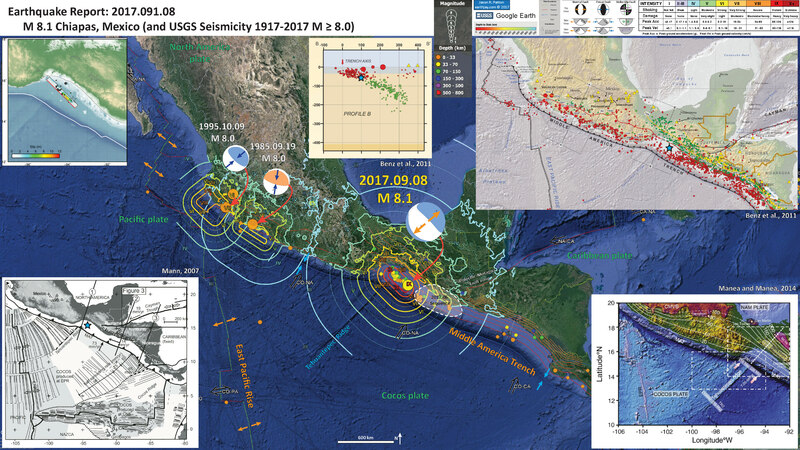 The 1976 earthquake occurred on the Motagua fault, a segment of the plate boundary that lies in southern Guatemala, about 650 km west-southwest of the hypocenter of the January 10, 2018, event. In May 2009, a M 7.3 earthquake occurred along the Swan Island transform fault approximately 300 km west of the January 10, 2018 event. The 2009 earthquake (which was much closer to land than the 2018 event) resulted in 7 fatalities, 40 injuries and 130 buildings being damaged or destroyed. There were some earthquakes associated with the Middle America Trench (MAT; a subduction zone) over the past year or so. 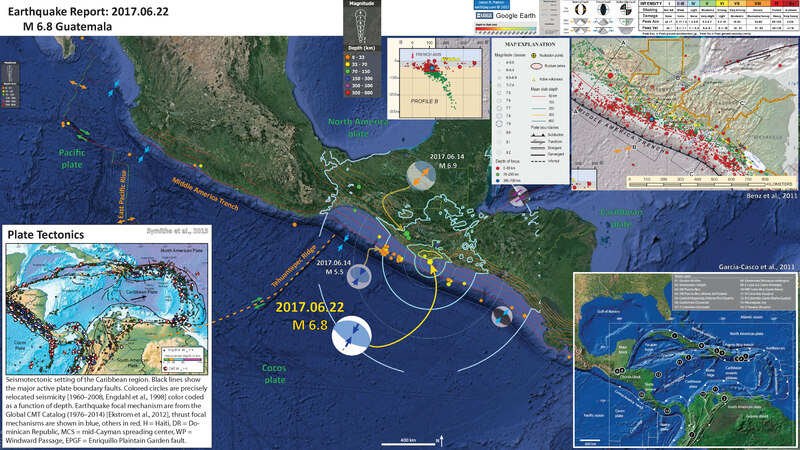 There may be some relation between the earthquakes and the onshore structures of the Swan fault system, the Motagua-Polochic fault zone. 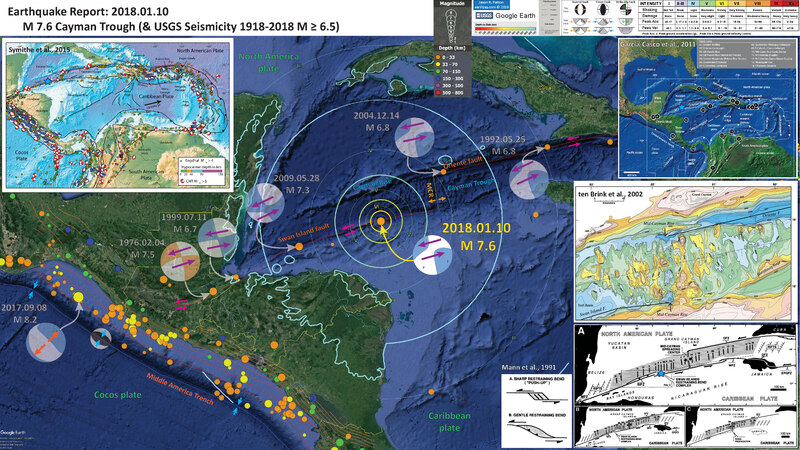 First there was a sequence of earthquakes in June near where the Motagua-Polochic fault zone splays towards the MAT. Here are my earthquake reports for these 2017.06.14 and 2017.06.22 earthquakes. The interpretive posters are below. Then, in September 2017, just to the north of the June sequence, there was a M 8.2 normal fault earthquake in the downgoing Cocos plate. Here is my earthquake report for this 2017.09.08 earthquake. Mann, P., Tyburski, S.A., and Rosencratz, E., 1991. Neogene development of the Swan Islands restraining-bend complex, Caribbean Sea in Geology, v. 19, p. 823-826. Ten Brink, U.S., Coleman, D.F., and Dillon, W.P., 2002. The nature of the crust under Cayman Trough from gravity in Marine and Petroleum Geology, v. 119, p. 971-987.